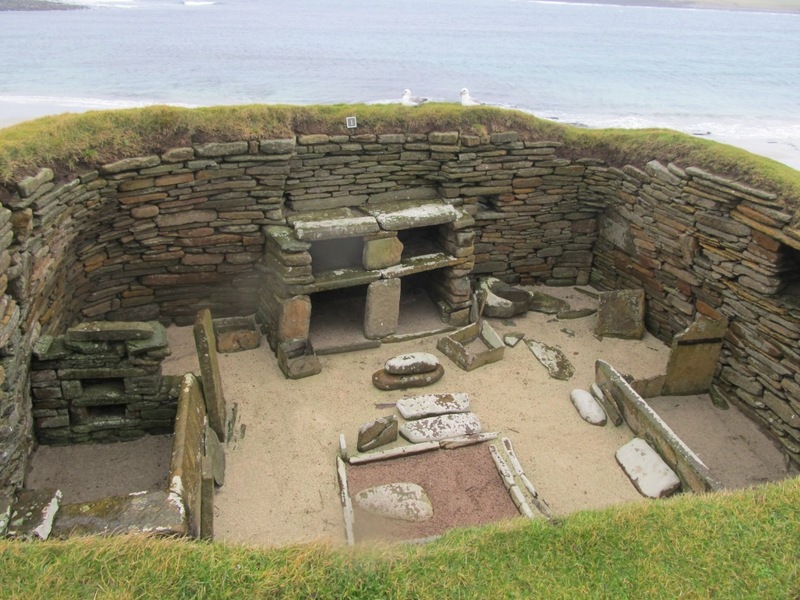 As promised, this is the first of a series of short blogs from our week on the Orkney Islands (with a detour to Shetland for the Up Helly Aa festival), concentrating on the naval and 16th/17th century historical aspects. Despite the best efforts of the British winter, we both made it to Orkney at just about the same time – yours truly via the ferry across a relatively benign Pentland Firth after a 3-day road trip (including a day’s stopover to do some research), Wendy by plane. 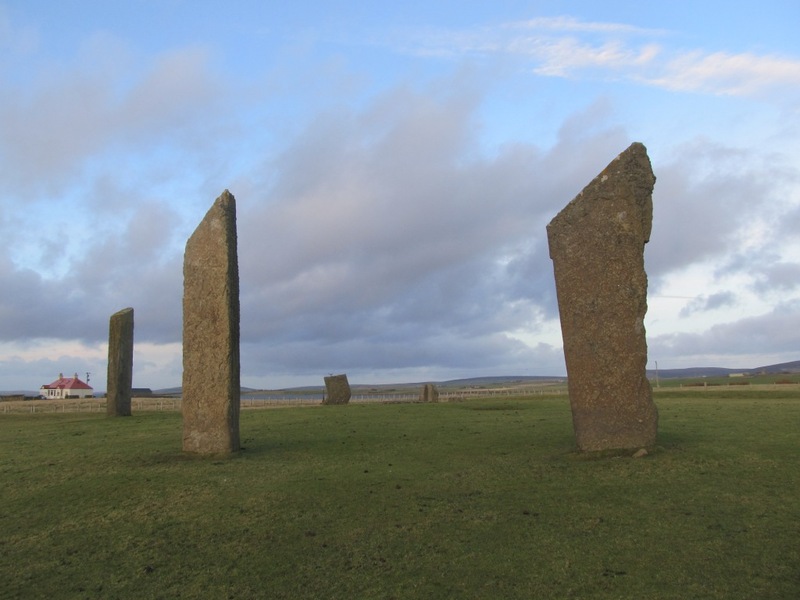 We’re staying right in the middle of Orkney’s major Neolithic heritage area, which has World Heritage status: the standing stones of Stenness are literally in the next field, the famous Ring of Brodgar and Maeshowe chambered tomb just short walks away. The wonderful house we’ve taken for the week is called Odin, which can be seen in the background of my picture of the Stones of Stenness above). It’s on the site of the so-called Odin Stone, which was destroyed by a local farmer in 1814, and was built in 1936 by a retired master mariner who wanted to see water from all sides of his home. The house contains a number of original fittings of the famous liner RMS Mauretania, which was scrapped at Inverkeithing in 1935 – unsurprisingly, this was one of the features which made us choose it for the holiday! Anyway, today started with a Neolithic-fest at the Ring of Brodgar and the astonishing Skara Brae village, which was occupied some 5,000 years ago, long before Stonehenge or the Pyramids were built. The remarkably intact houses were exposed by a storm in 1850, and subsequent excavations revealed a complex network of homes, linking passageways and workshops. Because so much stone was used in their construction, it’s possible to obtain a real insight into the lives of the Neolithic people who lived there; the ‘frames’ of their beds survive, as do the stone dressers that stood directly opposite the entrance to show off the occupants’ most treasured possessions. Stone-age bling, indeed – plus ça change! Best of all, we had the place virtually to ourselves. Apparently they get something like 2,000 visitors a day at the height of summer, and as it’s a relatively small site, one wonders just how good the experience can be. We had cold wind and rain at Skara Brae; by the time we got to Marwick Head, a short way up the coast, it was just the wind, with the sea breaking spectacularly onto the rocks below. (See the picture at the end of this post.) 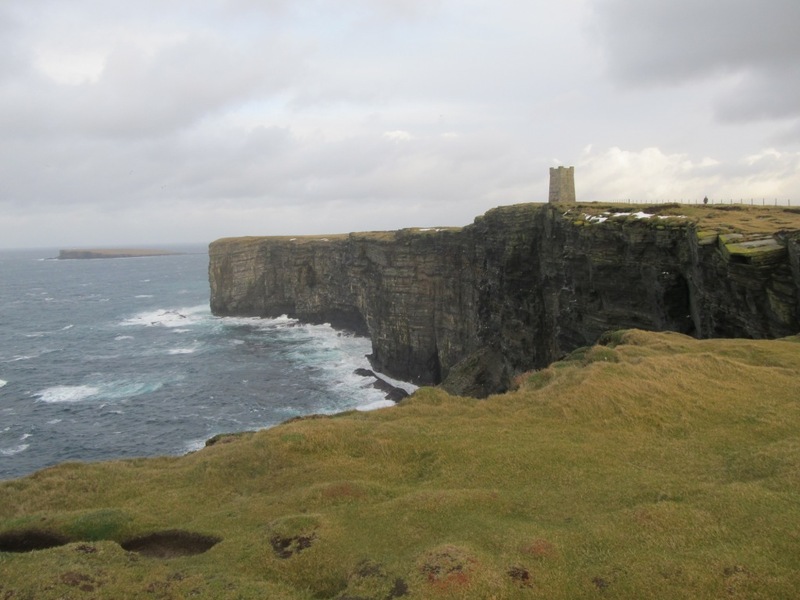 A fairly steep cliff path took us up to the memorial tower erected by the people of Orkney to Field Marshal Earl Kitchener, who was killed in these waters on 5 June 1916 when the cruiser HMS Hampshire struck a mine. Interestingly, the memorial plaque eulogises Kitchener but mentions the loss of the ship and 643 of her 655 men almost as an afterthought. Our final stop for the day was the Earl’s Palace at Birsay, in the north west corner of Orkney’s mainland. This was built in the late 16th century by Robert Stewart, Earl of Orkney, the illegitimate half-brother of Mary, Queen of Scots. 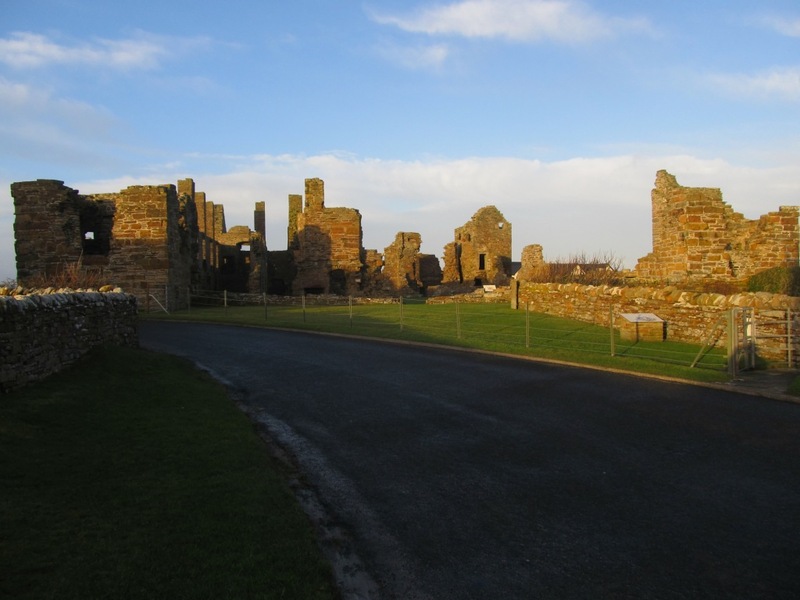 His harsh, oppressive rule on the islands (and on Shetland) was merely the prelude to the bizarre record of his son Patrick, who built a vast new palace in Kirkwall, the Orcadian capital. 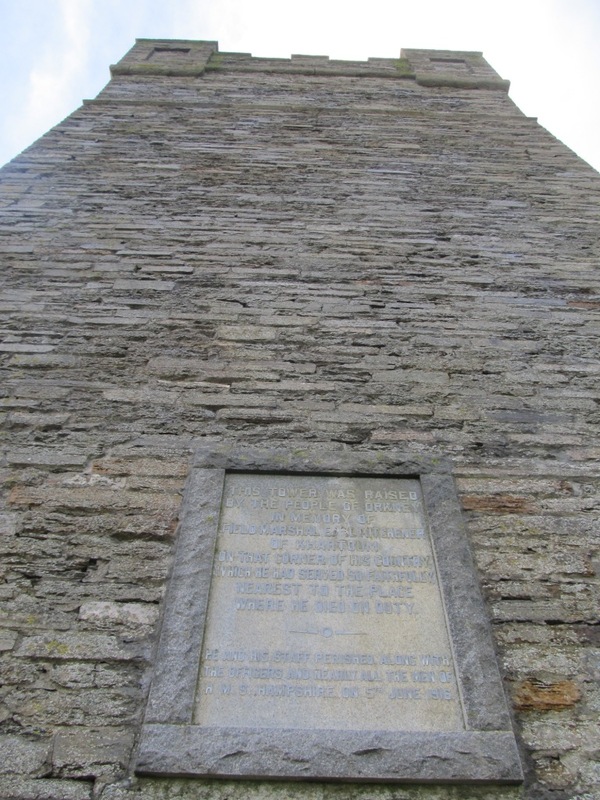 Known as Black Patie and regarded in Orkney’s history as ‘a symbol for evil and misrule’ (Oxford Dictionary of National Biography), Patrick was executed in 1615 after becoming implicated in a revolt by his illegitimate son. My interest in this period of Scottish history runs deep – hence my book, Blood of Kings, about the ‘Gowrie conspiracy’ of 1600 – so when I saw a new book on the Stewarts Earls of Orkney on sale at the Skara Brae visitor centre, I snapped it up! I also bought James Miller’s book on the Royal Navy’s use of Scapa Flow, and all being well, it’s that side of Orkney’s history that we’ll be exploring tomorrow. I hope to post about that tomorrow night, so please check back then!